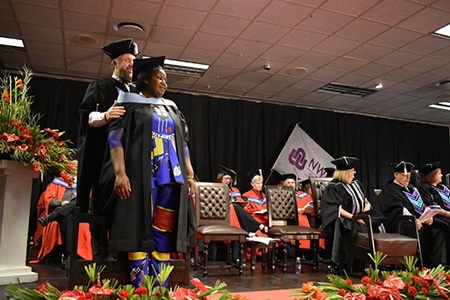 The third day of the four-day graduation ceremony of the North-West University’s (NWU’s) campus in Vanderbijlpark did not only represent the culmination of years of study for graduates, but also bore witness to the rich cultural diversity evident at the institution. A total of 442 students from the Faculty of Humanities obtained their undergraduate and postgraduate degrees. In his address Prof Mashudu Mashige, executive dean of the faculty, said that graduation ceremonies are opportunities to celebrate not only success but also diversity. “Every graduation ceremony is a celebration and acknowledgement of diversity and therefore transcends the boundaries of language, creed and culture” said Prof Mashige and added that the unique unitary imperative of the university is built upon such multiplicity. The day saw four students being applauded as top performers in their respective degree courses. These students were: Marilie Viljoen (Social Work), Lindall Stadler (Industrial Psychology and Labour Relations Management), Chelsea Graham (Education in Foundation Phase) and Chavon Botha (Education in Senior and Further Education and Training Phase: Technica). In closing, Prof Robert Balfour, the deputy vice-chancellor for teaching and learning, said that the NWU – as a recognised institution for academic excellence and quality education – is proud of its growing alumni fraternity. He praised students for their commitment towards their studies and motivated them to continue to champion transformation – be it in their respective communities or their professional environments. By referring to the challenges within higher education such as #FeesMustFall and the drive to decolonise curricula, Prof Balfour said that the power of the collective South African student voice brought attention to the determination of students to succeed. He urged graduates to never settle for second best and to continue to act as enablers of a better future. More than 400 students obtained their degree qualifications during the third day of the Autumn Graduation Ceremony.